. 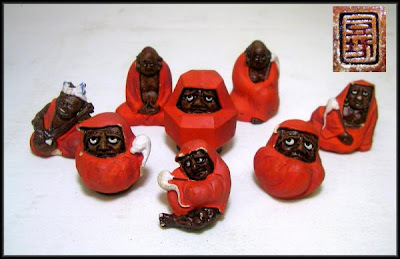 Kyoto Folk Art .
. Fushimi tsuchi ningyoo 伏見土人形 clay dolls from Fushimi .
. Kyoto no dorei 京都の土鈴 clay bells from Kyoto . Related to a story of the Chushingura Samurai Vendetta, near the Hachiman Shrine at 大山崎町の離宮八幡宮 Oyamazaki. While only a peripheral part of the story, these two scenes are very popular because of their fine staging and dramatic action. Kanpei is now living with Okaru’s parents and is desperate to join the vendetta. On a dark, rainy night we see him out hunting wild boar. Meanwhile, Okaru has agreed that her father, Yoichibei, sell her into prostitution in Kyoto to raise money for the vendetta. 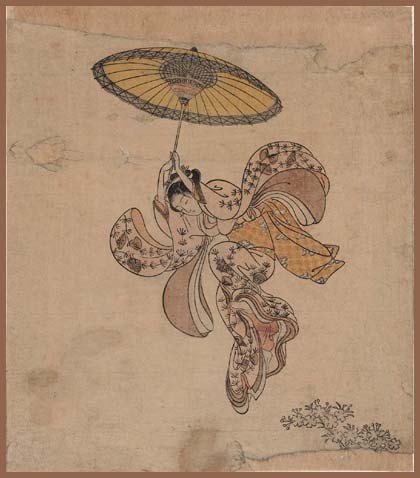 On his way home from the Gion pleasure quarter with half the cash as a down payment, Yoichibei is, however, murdered and robbed by Sadakurô, the wicked son of Kudayū, one of Hangan’s retainers. Sadakurō is dressed in a stark black kimono and, though brief, this role is famous for its sinister and blood curdling appeal. Kanpei shoots at a wild boar but misses. Instead, the shot hits Sadakurō and, as he dies, the blood drips from Sadakurō’s mouth onto his exposed white thigh. Kanpei finds the body but cannot see who it is in the darkness. Hardly believing his luck, he discovers the money on the body, and decides to take it to give to the vendetta. One plays the shamisen, look on the left. One in the back sits in Zazen meditation with folded hands. There are eight little dolls. Usually you find one or two at an antiques fair, here they are all together. Most are just 1 to 4 cm high. 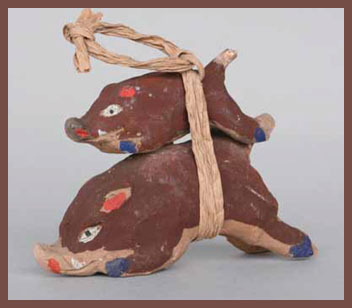 They started to be made in the early Meiji period. THey come in a little bag with a bamboo bottom or paper bottom. 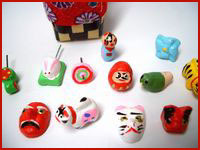 Popular motives are 七福神 the Seven Gods of Good Luck, 雛人形 Hina Dolls, 金太郎 Kintaro and other well-known heroes. 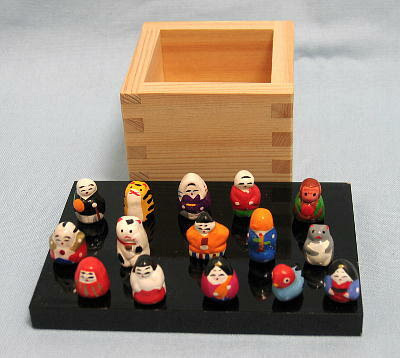 There is also a set of 郷土玩具のセット "Local Folk Toys". 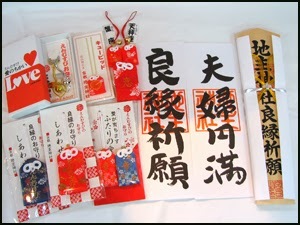 Another set comes in a special pouch called Shingen-bukuro 信玄袋 with a bottom of strong paper and a draw-string to close it. This bag contains 12 pieces, 犬・虎・だるま・天狗面・狐面・ねずみ・独楽・鳩笛・でんでん太鼓・獅子頭・こけし・風車.
. Shingen-bukuro 信玄袋 Shingen drawstring-pouch . One of the terms commonly given to similar wares produced by several local kilns and associated with the old pottery market which still exists on the hill leading to Kyoto's Kiyomizudera 清水寺. What is now called Old Kiyomizu ko-kiyomizu 古清水 is actually the pottery that emerged during the Kan'ei 寛永 era (1624-44) from kilns in Yasaka 八坂, Otowa 音羽, Kiyomizu, and Mizorogaike 御菩薩池, all in Kyoto. It was not until the potter Nonomura Ninsei 野々村仁清 became active after 1647 that the overglaze enamel techniques and decoration associated with Kiyomizu ware were clearly established. .Tea cup with Daruma Hina Dolls . in Kyoto was founded in the early Heian period. The temple dates back to 778. The main hall has a large veranda, supported by tall pillars, that juts out over the hillside and offers impressive views of the city. Large verandas and main halls were constructed at many popular sites during the Edo period to accommodate large numbers of pilgrims. 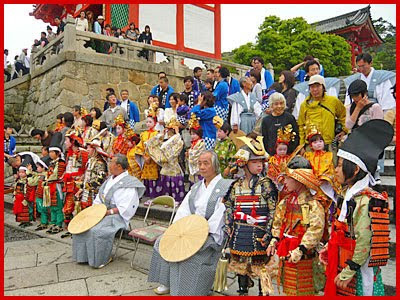 The popular expression "to jump off the stage at Kiyomizu" is the Japanese equivalent of the English expression "to take the plunge". This refers to an Edo period tradition that held that, if one were to survive a 13m jump from the stage, one's wish would be granted. Two hundred thirty-four jumps were recorded in the Edo period and, of those, 85.4% survived. The practice is now prohibited. Go-Oo Ox Deity at temple Kiyomizu . 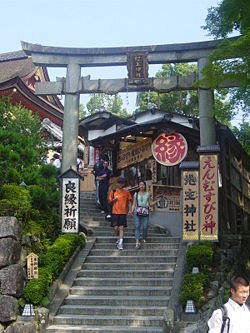 The shrine is famous for its "love divination". 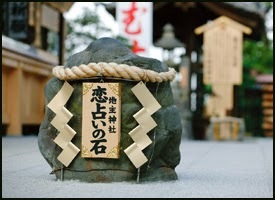 There are two large stones, koi uranai no ishi 恋占いの石, about as high as the knee. They are about 6 meters apart from each other and if the love seeker manages to walk between them with closed eyes, reaching the other stone straight, he can be assured his love wish will be fulfilled. koi no o-mamori 恋 お守り amulets for LOVE ! Festival for Jishu Gongen 地主権現. This festival was initiated by Enyuu Tennoo 円融天皇. Now parades of ladies clad in white and warriors in armor walk through down the Sannenzaka slope and the Chawanzaka slope in Kyoto. The Kiyomizu temple complex includes several other shrines, among them the Jishu Shrine, dedicated to Ōkuninushi, a god of love and "good matches". Jishu Shrine possesses a pair of "love stones" placed 6 meters/20 feet apart, which lonely visitors can try to walk between with their eyes closed. Success in reaching the other stone with their eyes closed implies that the pilgrim will find love, or true love. One can be assisted in the crossing, but this is taken to mean that a go-between will be needed. The person's romantic interest can assist them as well. Why 46000 days, you might ask? This is supposed to be the number of rice grains in one Japanese measure of rice, Japan being an old rice-growing nation and wasting even one grain of it was a big sin. 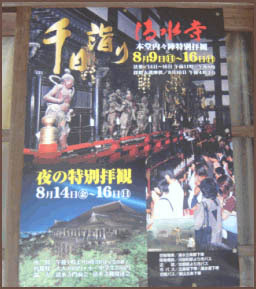 People visited the Kiyomizu temple on one of the days from August 9 to 16. This would bring the merit of 1000 temple visits, so it was a day of great hopes for a better after-life. 46000 days - Market at Asakusa Temple, Tokyo . "a star comes to Kiyomizu"
the statue of Kannon from temple Nakayama-Ji in Osaka changed into a star and came over to Kiyomizu temple in Kyoto. 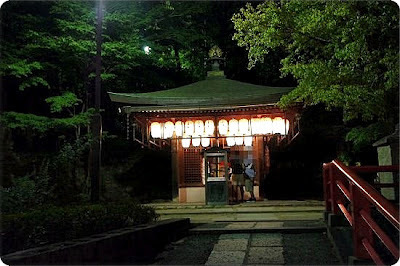 The monks celebrate the whole night with lights and prayers.
. OBSERVANCES - AUTUMN SAIJIKI . ANICCASIGHT has a great page with many photos about Kiyomizudera. It was said that Kiyomisu Dera was found by a Nara monk named Enchin who practiced asceticism. He met a Buddhist old recluse called Gyoei Koji while wandering nearby Otowa-ni-taki, to look for a site with golden stream to build temple, after being inspired in a dream. Gyoei told him that he was a devotee to Kannon Bodhisattva and had been waiting for him to come as he was to leave. He presented the monk a piece of wood log and left. Monk Enchin soon found a pair of sandals on top of the hill and realized that the old hermit was a Bodhsattva. The monk later created an image of eleven headed thousand armed image of Kannon and carved it on the sacred log given to him by Gyoei, and built a little hut to house it. One day, General Sakanone Tamuramaro(758-811) happened to pass by the water fall when hunting a deer. He met Enchin. Seeing him killing a deer and carrying it in hand, the monk delivered him a Dharma talk and lectured him with merciful teaching of Kannon Bodhisattva. General Tamuramaro repented and became a pious disciple to Enchin, devoted and in faith to Kannon. 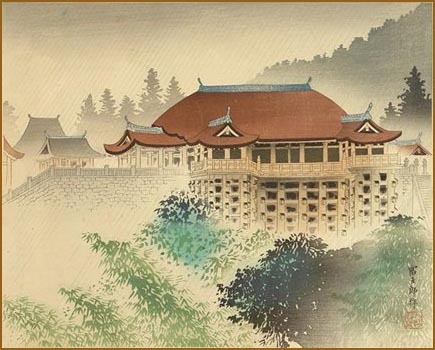 He donated a proper hall to enshrine the image of Kannon by dismantling his own house and in year 794, he contributed to the master The Emperor's old residence that was gifted to him after the emperor built a new palace when moved to Kyoto. The building was made into the main shrine hall of the temple.